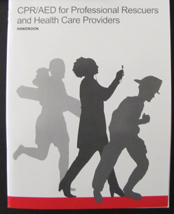 This is a page of common mistakes people make in a CPR/AED for the Professional Rescuer and Health Care Provider class. It is not complete training in CPR. It is not a list of all the possible mistakes. not putting the airway (lung bag) into the manikin properly and engaging it with the knob at the back of the manikin face. This will not allow air into the manikin’s lungs. 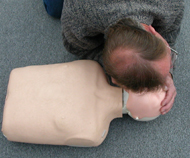 See: CPR manikin use for details. Go to page 22 of your book. Step 2 Telling someone to “call the police” instead of call 911. Not supporting the victim’s head and neck while rolling the victim. out away from the body, as in the photo below). 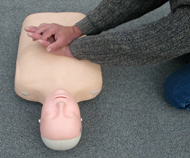 Agonal breathing is a gasping noise that many people make when they collapse from cardiac arrest. It can be mistaken for breathing. But a gasp or gurgle in the absence of normal breathing is not normal breathing. When checking for a pulse, not checking for pulse at the groove at the side of the neck on an adult. A common mistake with the H.A.IN.E.S. position shown below is to move too quickly and not carefully go through the steps, but just roll the victim instead. Pushing or lifting the victim’s head or neck. 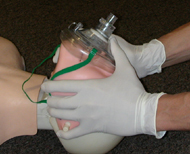 When using a BVM, concentrating on the use of the bag-valve-mask resuscitator and not tilting the head back far enough. Not making each thrust a separate and distinct attempt to dislodge the object. Forgetting to continue back blows AND abdominal thrusts. The photos below show wrong methods of holding and helping an infant. Compare them to your text. Poking your fingers around in the victim’s mouth if you don’t see anything to take out. (adult/child) Not properly locating hand position for compressions in the center of the chest. Compressions done out on the ribs or too high or low on the chest will not be effective. If you could see through to the rib cage, this is what it would look like where you correctly place your hand on the sternum. Notice in the next picture how big an adult’s fingertips are in comparison to an infant’s sternum (in this case a 15′ tall newborn). Be careful in your placement of fingertips to be certain your compressions will be effective. 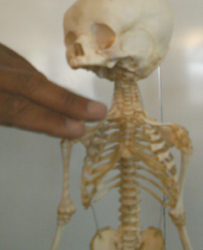 (adult/child) Placing the palm rather than the heel of the hand on the breastbone when giving compressions. rhythmic, you should spend the same amount of time compressing as you spend releasing. Not letting the chest fully rise to it’s normal position after each compression before pushing down again. Not stopping CPR if you notice an obvious sign of life. Being so busy with the steps that you fail to be sure that there are no flammable materials in the area, or fail to move a victim from puddles of water. remember, when you are facing the victim directly, with their torso aligned the same as yours, their right side is opposite your left side. Not being certain there is no one using a cell phone or radio within 6 feet of the AED. This may require telling a security guard who is on the radio to move. Wasting time checking for a pulse after a shock has been given. Start CPR again right away.